The immune system of ornamental fish can very often be weakened through various stress factors. Through this infections may occur, often without any recognizable reasons. This may be caused through transportation, bad environmental conditions, for example unbalanced food, poor water values and many more. The weakened fish reacts delicately to the disease-causing agent, which could be repelled by a strengthened immune system. 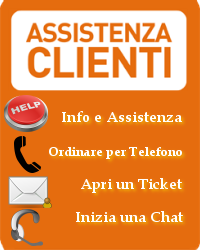 This is when aquavital stress-protect is introduced. 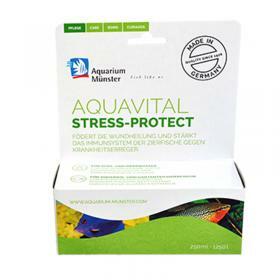 Through its balanced composition of 40 % Aloe vera extract as well as Iodine and Vitamin C, aquavital stress-protect strengthens the fish immune system, increases the resistance to the disease-causing agent and improves the fertility and well-being of the fish. The Aloe vera extract supports the mucous membrane form and contributes as a .natural unit" assisting in the anti-inflammation of healing wounds. The variety of active substances contained in the unique and natural juices of the Aloe vera plant leaves increases the body's defenses and protects against the influence of stress. The Iodine content in aquavital stress-protect supports the formation of thyroid hormone and prevents thyroid illnesses. The autonomic nervous system will also be strengthened. Through the Vitamin C content aquavital stress-protect strengthens the immune system and prevents vertebrae, gill cartilage and gill coating deformities. A lack of Vitamin C can result in the delay in growth and organ hemorrhage. The strengthened ornamental fish shows visible signs of well-being and a blaze of color. Use aquavital stress-protect on a regular basis in order to strengthen the body's defenses. Administration is especially recommended in the following specific stress situations. Use aquavital stress-protect regularly everyjourteen days. Add 10 ml of aquavital stress-protect to every 50 I of aquarium or pdnd water via the waterflow from the filter. When administration aquavital stress-protect to a garden pond mix the required amount in a watering can or bucket with pond water and distribute the mixture evenly over the surface of the pond. A dark coloring or sediment in this natural product is normal. Keep aquavital stress-protect in its original package and away from light and heat. Do not exceed the dosage of aquavital stress-protect. The usage of aquavital stress-protect can cause a slight reduction of the pH-value. With a carbonate hardness of less than 3° dKH reduce the dosage by half and observe the pH-value.